Trash Mash-Up was in residency for two weeks at the East Mountain High School in Sandia Park, New Mexico. The workshops were an end of the year discovery experience, which culminated in a public performance. TMU’s residency was co-sponsored by Talking Talons Youth Leadership. Talking Talons is a not-for-profit youth development organization that transforms generations of environmental leaders through experiences with nature. 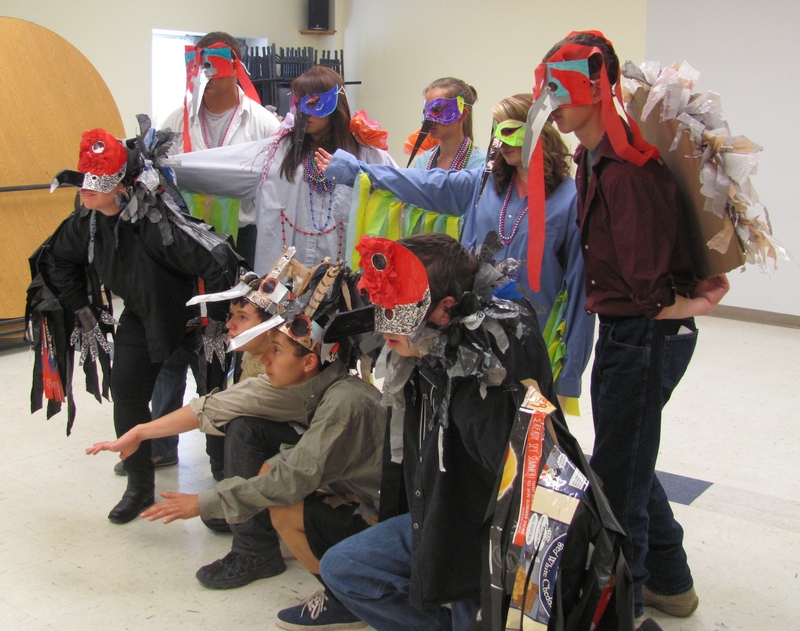 Students explored themes of social and environmental justice through art and culture in addition to studying birds of the Southwest. Studied disposables items and their life cycle, mapping our impact on the world, with a special focus on plastic bags. Explored social justice issues locally to internationally and what other young adults are doing to solve these problems. Studied inaction through “Perils of Indifference” by Elie Wiesel. Learned about local ornithology and were sponsored by Talking Talons. Talking Talons came to the classroom with an owl and hawk to deepen our experience with local birds. Traveled to the International Museum of Folk Art for a docent tour of their special exhibits. Visited by Guest Artist from Albuquerque, Marya Erin Jones, founder of ABQ Zine Fest and the ABQ Zine Library, and created our one original zines. Hiked every day through the school’s property observing, drawing and writing about the natural world around us.